A 10-minute walk from Suthisan MRT Station, The Travellers Hotel is located along Rachadapisek Road in Bangkok's Din Daeng Business District. It offers free Wi-Fi, 24-hour reception and free parking. 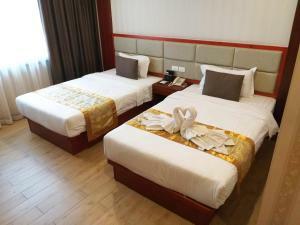 The Travellers Hotel is a 40-minute drive from Suvarnabhumi Airport. Via the MRT train, it is just 2 stops from major malls like Tesso Lotus and Carrefour. 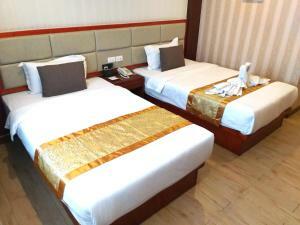 Simply furnished, rooms at The Travellers are equipped with air conditioning and cable TVs. In addition, each room also comes with a minibar, hairdryer and personal safe. Guests may rent a car to explore Bangkok at leisure or make use of the fax and photocopying services. 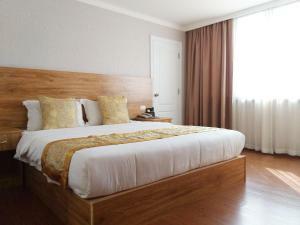 For convenience, the hotel also provides laundry and dry cleaning services. Authentic Thai and Western dishes are served at the hotel's restaurant. A daily buffet breakfast, as well as room service, is available. Rate: THB 1317.50; select dates below to get current rates.